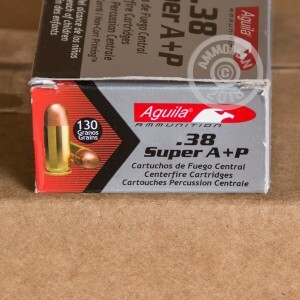 Dedicated .38 Super shooters will appreciate the cost savings of this 1,000 round case of ammunition from Aguila. This .38 Super ammunition is a target load that delivers light recoil in 1911s. Each round fires a 130 grain full metal jacket bullet. Aguila ammunition is manufactured in Cuernavaca, Mexico by Industrias Tecnos, which has operated since the 1960s. 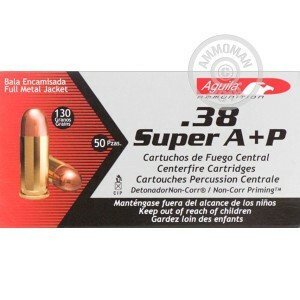 The .38 Super has long been popular in Mexico due to various restrictions affecting the ability of .45 ACP guns and ammo. 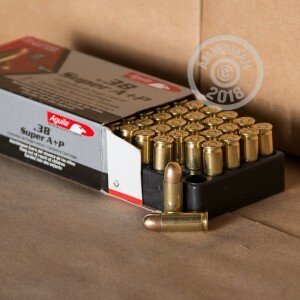 Purchase this ammunition or check out the rest of AmmoMan.com's great 500 and 1,000 round case deals and get free shipping on any order over $99!